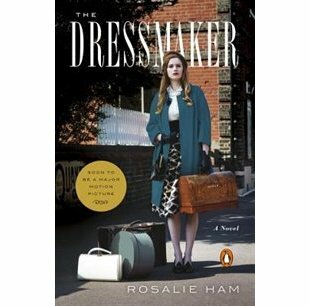 This month's book club selection was The Dressmaker by Rosalie Ham (not to be confused with another book called The Dressmaker that takes place on the Titanic). I mentioned in a previous post that this book has now become a movie starring Kate Winslet and Liam Hemsworth. This book takes place in Australia following World War II (I think, I don't remember ever having this detail nailed down), in a small rural town. We are given numerous details about the villagers, so much so that I eventually gave up trying to keep them all straight. We meet the main character at the start, she is making her way back home after living abroad as a dressmaker. Her mother is unwell and she has decided to come home to look after her. There are a few male characters that become part of the story, and I had a hard time trying to figure out who Liam Hemsworth would be playing in the movie. I finally checked IMDB when I was finished the book, and I was still kind of surprised about who it was. I didn't think his character was actually that important when I was reading it. It took me about halfway through the book to actually start caring about the story, but even then, I was not overly impressed with the way the plot played out. There was too much death, carnage and bad luck. I think I know what the author was trying to do, but I didn't really enjoy it. If I see the movie on Netflix or on TV somewhere I will check it out, it will be interesting to see how the movie adapts the story. It says it is a comedy drama, but to me, I didn't get much comedy from the book.